저희들은 도쿄에서 고카트 렌탈 서비스 운영하고 있는 카트 아키하바라입니다! 도쿄 여행 최고의 하이라이트가 되어드리겠습니다! 혼자여도, 친구 또는 가족과 함께여도 고카트&코스튬과 함께 최고의 추억을 만들어보세요. 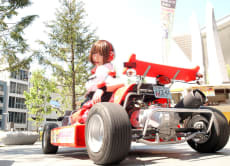 Rent a Go-Kart and ride around Akihabara Tokyo! Best time! 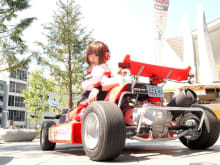 Great way to see Tokyo in a fun way. Couldn’t stop smiling the whole time, zooming through back streets and busy streets but felt safe the entire time. Host always stops/pulls over if you get left at a red light to make sure you catch up. No need to bring a mask for the smoke as host provides this too. All the little kids around tokyo love to give you waves so wave back and make their day! Highly recommend! If you have time to do this, book it right now. A look at Tokyo thru a different lens and it’s a once in a lifetime experience. Host was super nice, great experience! They sent my pictures a month later, wow! Many thanks, definitely recommend it.